You are here: Home / Den Talk / Contest / Contest >> Lions and Riders battle at BC Place on Sunday; Win two tickets! 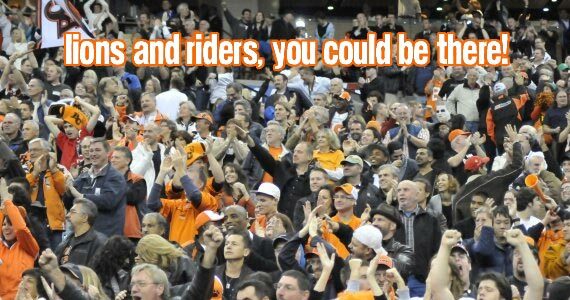 Contest >> Lions and Riders battle at BC Place on Sunday; Win two tickets! CONTEST CLOSED: Congratulations to Brad Johnson @bradjawnsin on Twitter! He’s the randomly drawn winner of out ticket giveaway for the BC Lions and Saskatchewan Roughriders game. Thanks to everyone for entering, and stay tuned for more contests in the future! When the BC Lions and Saskatchewan Roughriders get together it’s usually an intense couple hours of football. Sunday should be no different and the roof will be open, the sun will be shining with a rare 4:00pm kick off. Comment on the post about this contest on our Facebook page. RT the following to Twitter to win. You’ll be entered three times if you do all three! Our winner will be announced Saturday afternoon! Winner will have to pick the tickets up at the tailgate party on Sunday, located at Quebec and Terminal.